I’m sorry to be the bearer of bad news. But if there is a child of color in your life and if you ever read to them – then they have already experienced racism. First let’s clear one thing up. When many people think racism, they think extreme. Overtly aggressive, easily-identifiable. Slavery, KKK, Jim Crow, Japanese internment, etc. To be sure, very racist. But these overt forms of racism are now widely condemned and far less common. They still happen no doubt, but nowhere near the level they used to. No. These days racism has gone stealth; often taking less obvious, insidious forms. Harder to find. Harder to fight? Nowadays we understand racism as a system of oppression that unfairly advantages some (whites) over others on the basis of phenotype (skin color). Take a look around you and it’s easy to see this system of privilege in place. Who lives in the poorest neighborhoods? Who lives in the richest? Whose children go to the lowest funded, most scantily equipped schools? Whose children go to the most expensive, richly resourced private schools? When my son was born I enthusiastically set out to find children’s books that celebrated and reflected our family’s unique multiracial Asian heritage. I figured there were so many mixed kids now I’d find tons of stuff. If not about mixed Asian (which admittedly is very specific) at least about Asian, multiracial or multicultural. I found a handful of books and then? Myself beating my head against a brick wall. I was mystified, frustrated and then infuriated. What was going on? I suddenly got that sinking-yucky-PoC feeling, “Uh oh there’s something racial happening here.” Not sure what else to do I began blogging, researching and collecting resources on my own. Then early this summer my fears were confirmed. About the same time data revealed that, for the first time, whites had fallen to a minority in America’s under-5 age group a 2012 report from the Cooperative Children’s Book Center (CCBC) at the University of Wisconsin-Madison garnered quick internet and media attention. 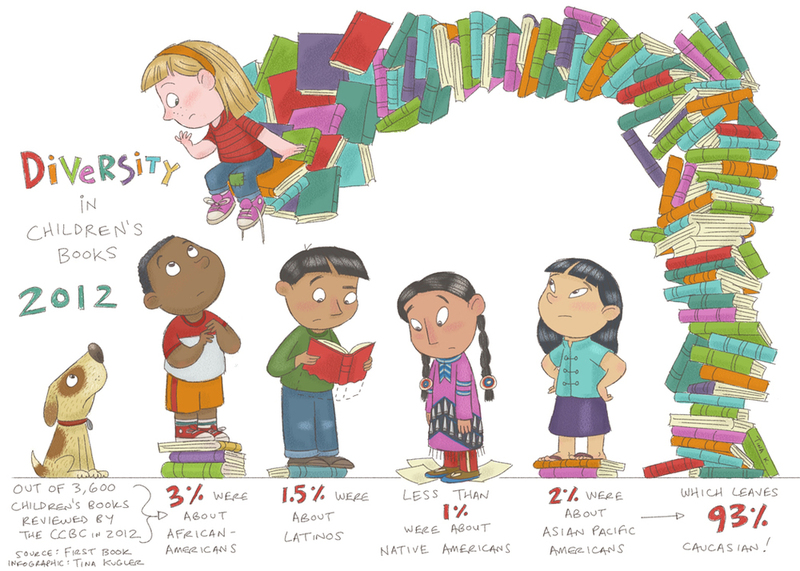 The CCBC report found that despite our increasing diversity, the number of children’s books written by or about people of color is very low and has not changed in 18 years. Of the 3,600 books the CCBC received last year, only 3% were about African Americans, 2% were about Asian Pacific Americans, 1.5% were about Latinos, and less than 1% were about Native Americans and these numbers have stayed fairly consistent since the CCBC started keeping statistics in 1994. Some argue there isn’t large enough demand for main characters of color while others argue there can’t be a demand for something that’s not on the market. But boil it down and it very simply looks like this. There are still few minority owned publishing companies in the U.S. Publishing is disproportionately controlled by whites who continue to favor producing products by, for, and about their own race despite very real evidence that the market demands something more diverse. This then has the trickle down effect of impacting what’s available to you and your family at bookstores, libraries, schools, etc. Yes people. It’s systemic. It’s institutional. It’s covert. It’s about power and race. That’s racism. And your children of color are at a disadvantage because of it. “Young children are learning about who is and isn’t important. Invisibility erases identity and experience; visibility affirms reality. When children see themselves and their families reflected in their early childhood setting, they feel affirmed and that they belong. When children’s identities and families are invisible, the opposite happens. Children feel that they are unimportant and do not belong. These lessons from societal visibility or invisibility are among the most powerful messages children receive…Children absorb these messages every day, often without the adults in their lives even knowing what the children are learning” (pp.13-4). And at the end of the day, as these authors point out, this is something that impacts everyone regardless of race. According to FirstBook, a nonprofit dedicated to overcoming illiteracy, literacy is one of the best predictors of a child’s future success but when children see characters and hear stories that aren’t relevant to their lives, it makes it harder to engage and interest them. Low levels of literacy are associated with lower educational, employment and health outcomes, and that will ultimately cost the United States more than a quarter of a million dollars each. Children’s books are also one of the most important launching pads for discussions about tough things (e.g. trying new foods, being scared of the dark, bullying, etc). If there aren’t many diverse children’s books then we can guess adults aren’t starting meaningful conversations on the subject at home, in school, etc. Indeed in the popular 2011 Nurtureshock, authors Pro Bronson and Ashley Merryman verify 75% of white parents almost never talk to their kids about race Let’s follow this through to its obvious conclusion. We’ve got silence from the critical adults in children’s lives. We’ve got covert societal messages about who is and is not important via (in)visibility. We’ve got our children, left to themselves, easily making misinformed generalizations about groups of people (and not telling us about it). And then we’ve got their fairly innocent pre-prejudices, left mostly unattended, growing with them into…bias. And voila! Racism is reborn. The early years are critical in setting the stage for who we become and the things we learn as children are the hardest to unlearn. So this is also a critical point of intervention for addressing racial inequities in this country. How can we ever undo racism if its foundation continues to be solidly, firmly poured in place? It isn’t only about naïve children and cute children’s books. It’s about the fact that we still aren’t having the conversations and we aren’t having them early enough. If we truly want to make a difference, let’s head it off at the gate. Find out who’s trying to make a change and how you can help. Here’s are a couple of places to start: FirstBook’s solution and Lee&Low Books and Cinco Puntos discussion of multilcultural publishing. ~ Guest blogger Sharon Chang maintains the blog MultiAsian Families. They [the multiracial movement] need to become more aware of the politics of race in the United States rooted in equality concerns not cultural identity concerns. Cultural identity is fluid and highly personal, but racial justice is a need for the collective to embrace with an understanding of how nonwhites are viewed. Natalie, as well as sociologists Rainier Spencerand Jared Sexton, suggests, the problems between biracials and Blacks are rooted in biracials placing a higher priority on personal identity recognition than on universal racial justice. McWhorter’s argument is based on a false assumption and only serves to frame Blacks as racist and pathological–as much of his work does. Arguing Blacks are the party championing racism, it is McWhorter who has embraced the colorblind lie and denial of the systemic nature of race in America. This excerpt reveals McWhorter’s assumptions about Blacks. In this statement it is clear McWhorter believes Blacks feel themselves to be a “lowly” and inferior race and thus perceive expressions of multiraciality to be offensive. However, as evidenced in their rich counter-frames, Blacks have historically maintained a positive self-image despite whites’ assault on their personhood. It is whites who view blackness as a lowly status, not Blacks. The historical record shows McWhorter’s assumption of Black self-loathing to be clearly incorrect. After this assumption is shown to be false, McWhorter’s argument collapses. Once it is shown Blacks love themselves, McWhorter doesn’t have an argument because Black self-hate is the core of why he believes Blacks oppose multiracialism.. 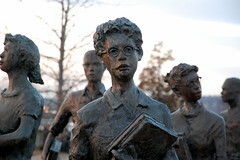 Therefore, biracials being encouraged to identify as Black is not an act of anger for “looking down on Blackness” or “letting racism win.” The frustration Blacks feel toward the multiracial project is a result of Blacks commitment to racial justice, not self-hate or internalizing racist classification schemes as McWhorter suggests. ever pass the University of Cambridge’s advanced mathematics exam. That’s on top of the fact they have set world records when they passed the A/AS-level math papers. Doubtless, he is underplaying parental efforts here, but still his point is dramatic. So, of course, in the U.S. we starve and re-Jim-Crow our inner-city educational programs for decades, then when the Bush Depression kicks in, our governments’ solutions include giving a trillion dollars in aid to Wall Street’s white-collar, low-intelligence deviants, but cutting back on many local educational and other social support programs that develop young talent in areas where we need it. Perhaps we need to send our (mostly white) politicians to study with this savvy father and his very talented kids. Maybe they can get their “low IQs” up a little? Revisiting the Kenneth Clark Study: White Racist Children, a Surprise? Spencer’s researchers asked the younger children a series of questions and had them answer by pointing to one of five cartoon pictures that varied in skin color from light to dark. The older children were asked the same questions using the same cartoon pictures, and were then asked a series of questions about a color bar chart that showed light to dark skin tones. The tests showed that white children, as a whole, responded with a high rate of what researchers call “white bias,” identifying the color of their own skin with positive attributes and darker skin with negative attributes. Spencer said even black children, as a whole, have some bias toward whiteness, but far less than white children. Well, whites invented and maintained the system of racial oppression, and its rationalizing white racial frame, with many anti-black and anti-other stereotypes–and lots of pro-white stereotypes as well. So, the white children get a much better “education” in racist stereotyping 101. And the Black children are having to fight back against this white racist framing of both virtuous whiteness and negative stuff about their own group. And of course black parents and children have to reframe this racist stuff. There is a strong, 380-year-old black counter frame against the white racial frame, in much of black America. Apparently, psychologists do not think much in historical and structural terms, or read research on systemic racism and the old white racial frame. Again, there is some good sociological literature over the last decade that shows just how early white children learn the white racial frame of African Americans and other Americans of color – which CNN and these psychologists might well have consulted too.